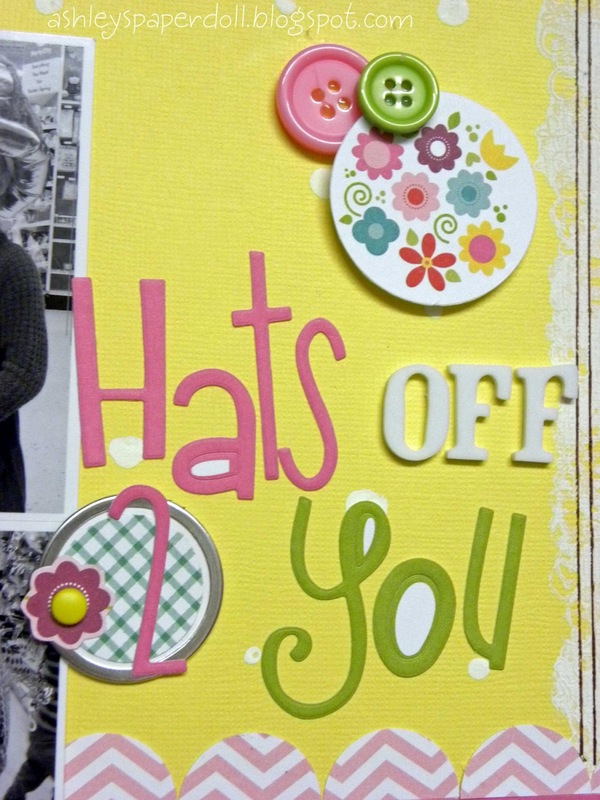 Ashley Horton Designs: I Did It! I set out this week, to complete all of the daily challenges going on at Bella Blvd. And now I am happy to say I accomplished my goal. Although, today started out a little bit "iffy", because we were up with our youngest last night until around 3:30AM. Seems to be that he contracted a tummy virus from someone at church yesterday...those are the times that I can say, it's definitely not okay to share!! :) He is still not feeling great today...cranky, tired, doesn't want to eat, and still running a little fever, but hopefully it is only a 24 hour virus. Now, back to my layout!! Today's challenge, was to use punched circles. I love using my circle punches on my layouts, and I actually used it on my layout for yesterday's challenge, before I even knew what today's was!! :) So for this page, I used my 1 inch punch to create the chevron, scalloped border across my page and for the large flower. I punched a total of thirteen, 1 inch circles and layered them around the base of a 2 inch circle. Then I used my 1/4 inch punch for the smaller circles in the center of the flower. I always think it's fun when you can take a paper line and use it out of context, which is what I did for this layout. 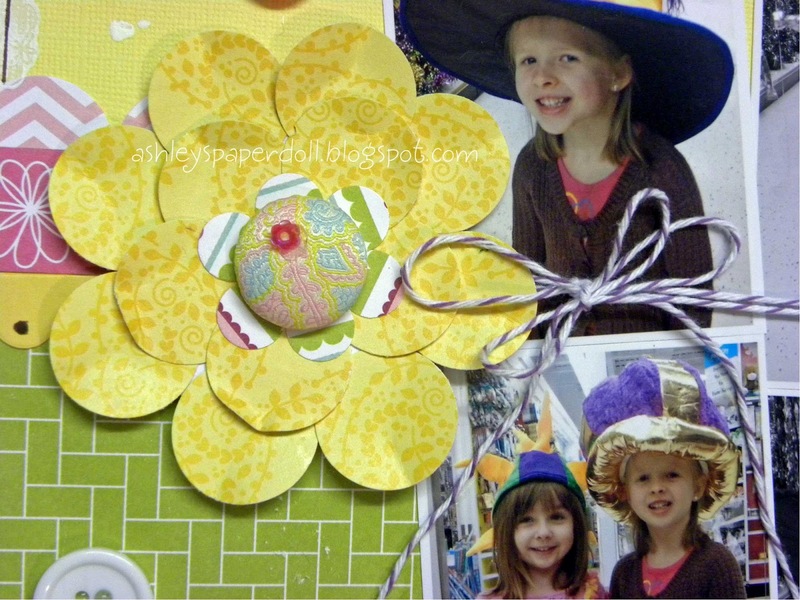 I used Bella's Spring Flings and Easter Things, which obviously from the name, you can gather that the line focuses on Spring and Easter. 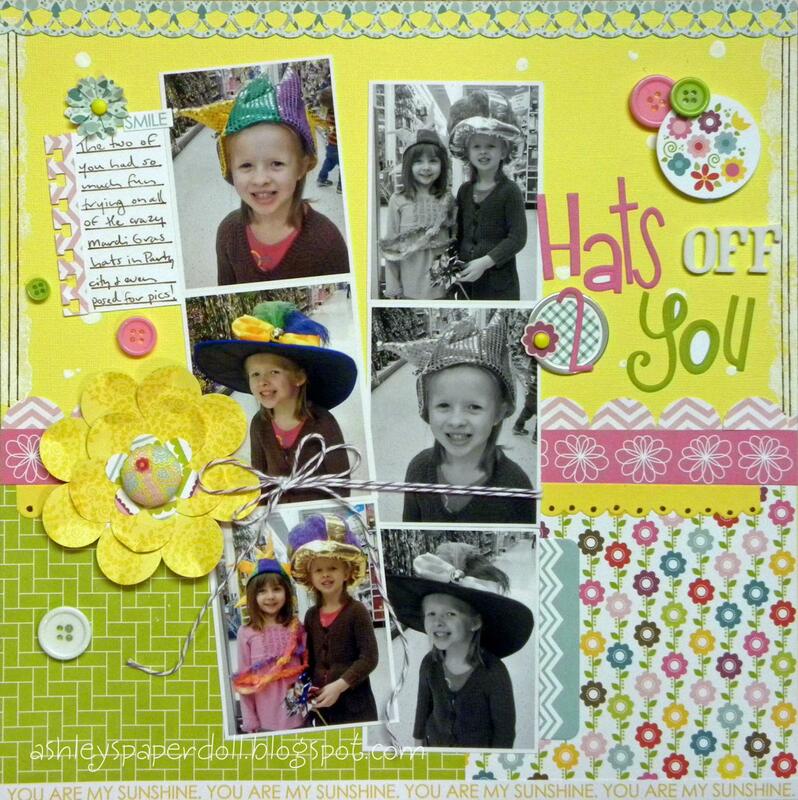 But I thought the papers coordinated well with these funny photos of our daughters trying on all of the Mardi Gras hats in Party City, so I decided to pair the line with these photos. Mardi Gras colors are Green, Yellow, and Purple and each of these colors are represented on the page, but it doesn't come off as a "Mardi Gras" layout, which is what I was going for on this one. Very cute! 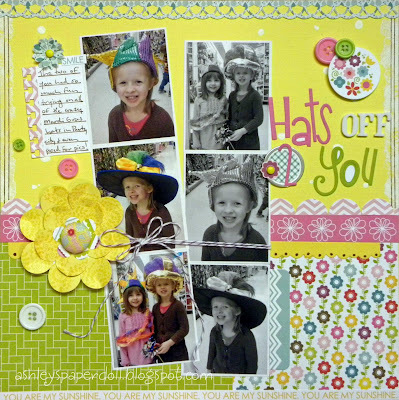 Love the mix of color and b&w photo strips! The way you did the title is darling! I have done 4 all ready and hoping to do #5 tomorrow morning! I LOVEEEEEEEEEEEEEEEEEEEEE this one!! 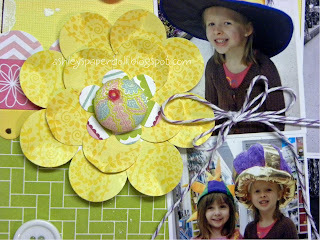 Such FUN photos and loving loving loving the circles and buttons! Hope your little one feels better! oh what another cool page!! I don't have much Bella so so far I have only done 1 page! Love that border!